It’s a new quarter at DePaul, and we just wanted to take a moment and remind you of a few items as we start getting ramped up for autumn! 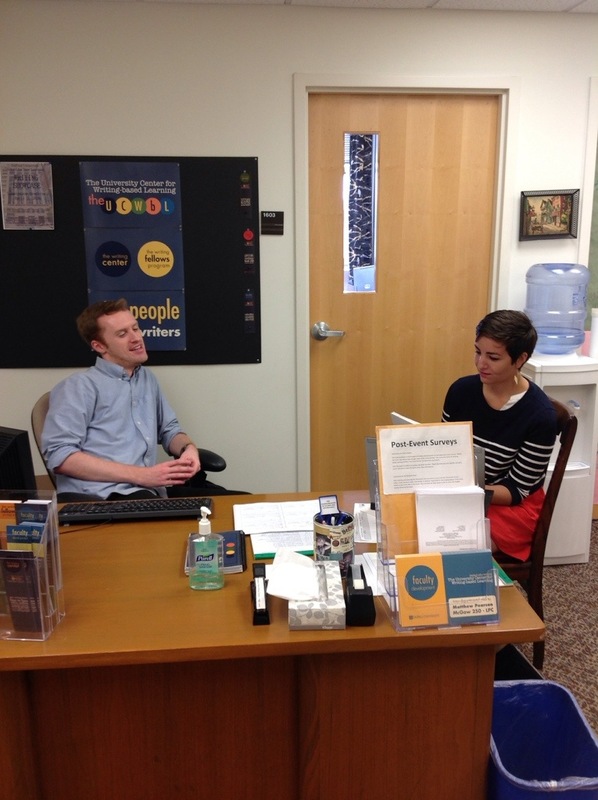 -Appointments at the UCWbL are for everyone! Whether you are working on a resume, a poem, a research paper, or anything in between, the UCWbL wants to help you with any kind of writing you have. -Appointments at the UCWbL aren’t just for struggling writers. We are happy to help even writers who feel confident in their work. It always helps to get another pair of eyes on a piece! -Appointments at the UCWbL are for creative writers too! Believe me, there are so many people here who would love to get their hands on a poem, short story, or memoir! -Get involved at the UCWbL! There are so many great opportunities for everyone at the UCWbL. Join a writing group, attend a Walk and Talk with the collaborative for multilingual writing and research, and check out Scrawl Radio every Friday starting next week! Really, that’s just the tip of the iceberg. If you have any questions about the UCWbL please visit depaul.edu/writing or leave a comment here! If you’re new, welcome to DePaul, and if you’re coming back, we are glad to see you again. You look great today, everyone. For a while now I have been asking myself how I can make a career out of my writing. My immediate answer would be to write novels and short stories. However, I am not naive enough to think that that will be able to keep a roof over my head and food in the fridge, not to mention in my tummy, without some other means of supporting myself. So what other skills have I learned over the last four years that will allow me to get a job that I will not absolutely hate but still allow me to write? The Unpaid Internship – Cruel and Unusual or Necessary Evil? I write because I have to. This isn’t because I’m in school and I am assigned to. I write because it is the best way I know to express myself. I write because it is what I love to do. I write because it is my life. The Chicago Land Writing Center Conference! It was held this past weekend at North Park University and was filled with interactive discussions on tutoring people with learning disabilities or ADHD, round robin tables on topics ranging from community building to transitioning from working at one writing center to another, conversation cafes, and a discussion panel with Harold Washington’s all professional-tutoring staff.